method, in accordance with the reference(s). 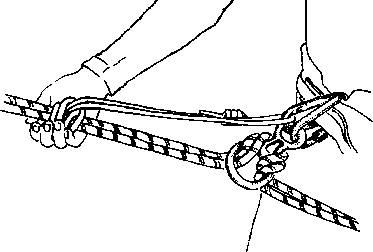 9)ln a summer mountainous environment, execute a rescue on a one-rope bridge, in accordance with the reference(s). 9Eln a summer mountainous environment, retrieve a one-rope bridge, in accordance with the reference(s). ^HWithout the aid of references, list in writing the rescue techniques, in accordance with the reference(s). ^HWith the aid of references, list orally the criteria for site selection for a one-rope bridge, in accordance with the reference(s). ^HWith the aid of references, given a MAC Kit, and a simulated or actual obstacle, construct a one rope bridge, in a specified time limit and in accordance with the references. ^^In a summer mountainous environment, cross a one-rope bridge using the rappel seat method, in accordance with the reference(s). ^^In a summer mountainous environment, execute a rescue on a one-rope bridge, in accordance with the reference(s). 9EIn a summer mountainous environment, retrieve a one-rope bridge, in accordance with the reference(s). 4| METHOD/MEDIA. The material in this lesson will be presented by lecture and demonstration. You will practice what you have learned in upcoming field training exercises. Those of you with IRF's please fill them out at the end of this period of instruction.